This model runs in OpenCell and COR, and the units are consistent throughout. It is not yet an accurate match for the experimental results. Abstract: A relatively simple method is presented for incorporating cross-bridge mechanisms into a muscle model. The method is based on representing force in a half sarcomere as the product of the stiffness of all parallel cross bridges and their average distortion. Differential equations for sarcomeric stiffness are derived from a three-state kinetic scheme for the cross-bridge cycle. Differential equations for average distortion are derived from a distortional balance that accounts for distortion entering and leaving due to cross-bridge cycling and for distortion imposed by shearing motion between thick and thin filaments. The distortion equations are unique and enable sarcomere mechanodynamics to be described by only a few ordinary differential equations. Model predictions of small-amplitude step and sinusoidal responses agreed well with previously described experimental results and allowed unique interpretations to be made of various response components. Similarly good results were obtained for model reproductions of force-velocity and large-amplitude step and ramp responses. The model allowed reasonable predictions of contractile behavior by taking into account what is understood to be basic muscle contractile mechanisms. Schematic diagram of myofilament regulation and cross-bridge cycling giving rise to stiffness and distortion dynamics of sarcomere. 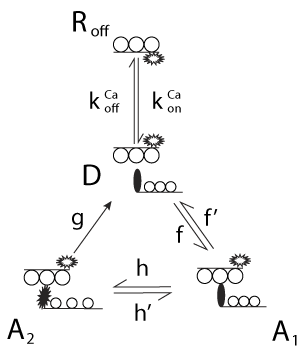 Actin thin-filament possessing the myosin-binding site is represented by chain of 3 circles (no stoichiometric relations are implied by 3 circles). Thin-filament regulatory tropomyosin-troponin complex, controlling myosin cross-bridge access to the thin-filament binding site, is represented by the bar spanning the binding site. Myosin cross bridge is represented by the globular head with coiled tail. Thin-filament regulatory unit may be in 1 of 2 steric configurations: the "off" position (Roff) or the "on" position. The on state may have different status depending on whether cross bridges are attached or not including "on" and cross bridges detached (D) and "on" and cross bridges attached (A1, A2). Attached cross bridges may be pre-power stroke (A1) or post-power stroke (A2). Cross bridge attachment, power stroke, and detachment occur cyclically. Steps in the cycle are governed by rate coefficients f, f ', h, h', g, where the forward attachment is governed by f, the forward power stroke is governed by h, and cross-bridge detachment is governed by g. Primes designate reverse reactions. Derived from workspace Razumova, Bukatina, Campbell, 1999 at changeset 7c9f3df86d00.